Are you ready to discover your WHAT—that is, the 1 amazing thing you were born to do? Would you like to powerfully impact both those who share this lifetime with you and those of lifetimes to come? In What Is Your WHAT? 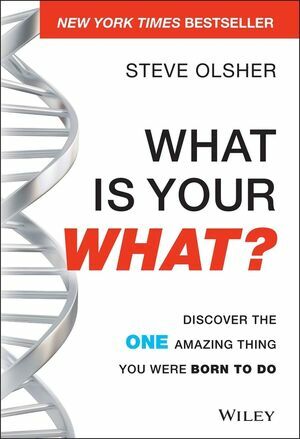 author Steve Olsher reveals his proven process that has helped thousands answer YES to these life-changing questions and cultivate a life of purpose, conviction, and contribution by identifying and creating a plan of action for bringing the 1 thing they were born to do to fruition. It is a timely, step-by-step guide that will guide you towards making both a fortune and a difference sharing your unique gift with the world. Steve’s singular approach to realizing permanent, positive change blends proprietary methods with ancient wisdom and revolutionary lessons from modern thought leaders. Leverage this proven system to discover your WHAT and realize ultimate achievement in business and life. STEVE OLSHER is an entrepreneur; creator/founder of The Reinvention Workshop; award-winning author of Internet Prophets: The World's Leading Experts Reveal How to Profit Online; creator/cohost of one of the industry's leading Internet, mobile, and marketing live events, Internet Prophets LIVE! ; keynote speaker; co-star of the film, The Keeper of the Keys; and media veteran who has appeared on ABC TV, Fox TV, NBC TV, CNBC.com and more than 300 radio shows, including national programs hosted by Lou Dobbs, Jim Bohannon, and "Mancow" Muller.